Emily Holubowich, Senior Vice President at CRD Associates, is CSTE’s Washington representative and leads our advocacy efforts in the nation’s capital. On September 28, Congress provided $1.1 billion in emergency supplemental funding to support epidemiologists and other public health professionals in the fight against the Zika virus—280+ days late and $800 million short of the President’s funding request. Despite the bill’s shortcomings, the funding is a welcome relief for those on the frontlines of the Zika response. On October 26, the Department of Health and Human Services (HHS) provided its spend plan to Congress as required by the law, detailing how the Centers for Disease Control and Prevention (CDC) and other agencies will allocate resources for a range of Zika-related activities. As expected, CDC will rely heavily on state and local health departments to prevent, detect, and respond to the epidemic. Specifically, CDC will award at least $70 million of its $394 million in Zika supplemental funding to support epidemiology, laboratory surveillance, and vector control and surveillance. CDC has already provided Epidemiology and Laboratory Capacity (ELC) supplemental guidance to states (proposals are due November 20) and funds will be awarded before the end of the calendar year. In addition, CDC will restore $44 million that was redirected from the Public Health Emergency Preparedness (PHEP) grants to support Zika-related activities in the absence of new funding—funding that is already making its way back to state and local health departments. With our attention now on the swift allocation of funding and ongoing response, it’s easy to forget how difficult it was to get here. The Council of State and Territorial Epidemiologists (CSTE) was actively engaged in efforts to secure Zika emergency funding during the last 8 months, first endorsing the administration’s request for $1.9 billion in emergency funding in February. Our vector-borne disease surveillance capacity assessment published in Mortality and Morbidity Weekly Report on the impact of budget cuts was a key pillar of our advocacy and education efforts, and was featured in a congressional hearing. CSTE actively participated in the “Zika Coalition” led by the March of Dimes, co-signing multiple letters to Congress and participating in meetings with key lawmakers. CSTE’s President-Elect Janet Hamilton of the Florida Department of Health took a break from her activities on the frontlines of the state’s Zika response to travel to Capitol Hill and share her experiences with a standing-room-only crowd of advocates, congressional staff, and lawmakers as part of the Coalition for Health Funding’s annual “Public Health 101” congressional briefing series, sponsored by the Congressional Public Health Caucus. The challenge to the public health community now becomes keeping lawmakers’ short attention spans on the long-term Zika response and the needs of the public health infrastructure, more broadly. Some lawmakers think they have already “solved” the Zika problem with the appropriation of the $1.1 billion in emergency funding. Not only is this funding insufficient to support the immediate response, it will not address Zika’s long-term threat nor will it address the underlying weaknesses of the public health system after years of underinvestment that have been exposed by the virus. Unfortunately, Zika is here to stay and will only get worse. As CDC Director Dr. Tom Frieden noted recently, “Zika and other diseases spread by [the Aedes aegypti mosquito] are really not controllable with current technologies. We will see this become endemic in the hemisphere." Meanwhile, the public health infrastructure will continue to buckle under the weight of mounting public health threats—both known and unknown. CSTE will continue to serve on the Zika Coalition’s steering committee to drive advocacy efforts around future funding needs for Zika response. CSTE will also continue to advocate for increased investment in ELC grants and the public health workforce. Only strong, stable, and sustained investment in the underlying public health infrastructure will ensure CSTE members and other public health officials are equipped and ready to combat all public health threats. 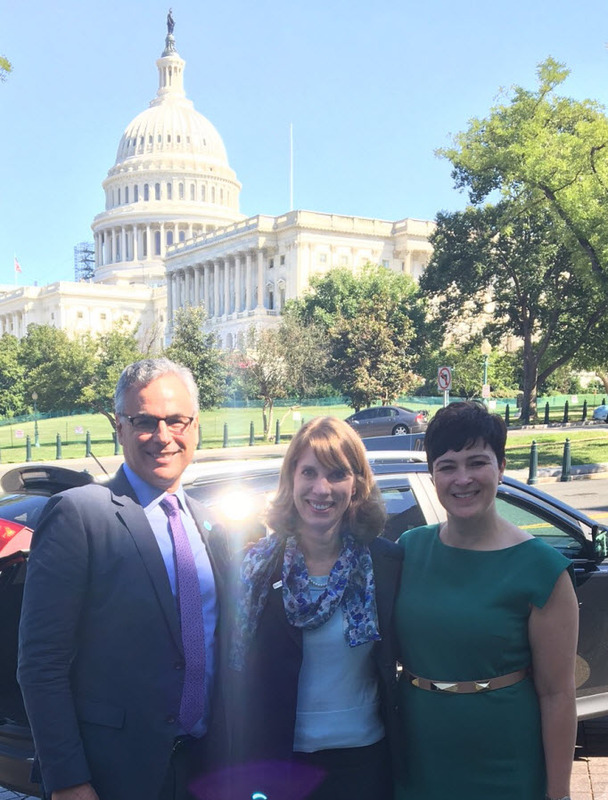 CSTE’s Executive Director Dr. Jeff Engel, President-Elect Janet Hamilton, and Washington Representative Emily Holubowich on Capitol Hill for a congressional briefing on the Zika response (Sept. 23, 2016).